Radio 5 live's Nicky Campbell has been getting Cha Cha Cha lessons from Strictly Come Dancing's Kristina Rihanoff. Fellow 5 live Breakfast presenter Shelagh Fogarty had to play the role of judge as a bad back put her out of the competition. Siberian-born Rihanoff is partnering DJ and Producer Goldie in Strictly Come Dancing 2010. There were some major changes to the format of Strictly when it returned to our screens in Autum 2009 for series 7. First of all, Arlene Philips departed the judging panel, to be replaced by former champion Alesha Dixon (and ballet dancer Darcey Bussell for the final few episodes of the series). For the first time in the history of Strictly, Bruce Forsyth fell ill and was unable to present one of the live shows - Tess Daly was ably assisted by Claudia Winkleman and Ronnie Corbett. This time round, sportspeople were the early casualties, with Martina Hingis, Richard Dunwoody and Joe Calzaghe all leaving the dancefloor in the first few weeks. Olympic athlete Jade Johnson - an early favourite to make it to the final - was forced to withdraw near the end of the series following an injury. The final four included three actors (Laila Rouass, Ali Bastian and Ricky Whittle) and one sports presenter - eventual series champion Chris Hollins, alongside his partner Ola Jordan (aka 'Team Cola'). For the sixth series of Strictly, broadcasting in Autumn 2008, a record-breaking 16 couples took to the dancefloor, meaning that the show was on air from 20 September right the way through to 20 December. Actors seemed to be the first fallers in this marathon race, with Phil Daniels, Gillian Taylforth, Jessie Wallace and Don Warrington all leaving the show in the first few weeks. Controversy raged in this series when journalist John Sergeant continued to be saved by the public vote, despite gaining much lower scores than evicted celebs like Cherie Lunghi and Heather Small. Eventually John Sergeant withdrew from the contest, leaving a memorable final four contestants to battle against each other for the trophy - Austin Healey, Lisa Snowdon, Rachel Stevens and eventual winner actor Tom Chambers with professional partner Camilla Dallerup. As we're only ONE DAY away from our first live show (9pm Friday, swiftly followed by ANOTHER live show at 6pm Saturday! ), we thought we'd be extra-nice to you all and reveal our final Training Diary video early in the day. So we proudly present couple No.14 - last but in no means least - actress Tina O'Brien and her partner, new pro dancer Jared Murillo. So have you enjoyed watching these training diary videos? Should we do them again next year? What are your thoughts on Tina and Jared as a couple? And out of the 14 couples, which ones stand out the most to you? Leave us a comment below! With just TWO DAYS to go until our double-whammy of live shows on Friday 1st and Saturday 2nd October, our carefully-timed countdown of Training Diary videos is almost complete as well. Tomorrow we'll reveal Tina O'Brien's video, but today it's the turn of England goalkeeping legend Peter Shilton and his partner Erin Boag to take to the floor. Will Peter manage to save himself from a bad performance? Share your thoughts with the world in the comments below. When Strictly Come Dancing returned for a fifth series in Autumn 2007, there were a few changes to the format. For the first time, the Results Show was now transmitted on a Sunday rather than a Saturday, and also for the first time the bottom two couples were forced to participate in the dreaded 'dance-off' to save their place in the competition. First off the dancefloor were Coronation Street actors Brian Capron and Stephanie Beacham, with presenters Gaby Logan, Dominic Littlewood and GMTV's Kate Garroway following shortly after. Kelly Brook, who looked as though she might challenge for the crown this year, was forced to withdraw following a family bereavement. In the end, the final three celebrities battling it out were Blue Peter's Gethin Jones, former EastEnder Matt di Angelo, and eventual champion Alesha Dixon (partnered with Matt Cutler). Showing just how popular Strictly Come Dancing had now become, the fourth series (broadcast in Autumn 2006) featured 14 celebrity couples. Early departures from the dancefloor included newsreader Nicholas Owen, singer Mica Paris, and comic Jimmy Tarbuck (on medical advice). Many fans were surprised when promising performer DJ Spoony went out early, to be followed in quick succession by celebs such as impressionist Jan Ravens, footballer Peter Schmeichel and Emmerdale star Claire King. In the end, the final three celebs battling for the title were Spice Girl Emma Bunton, rugby star Matt Dawson, and the eventual winner cricket star Mark Ramprakash (with pro partner Karen Hardy). With only three days left to go until our first live show (Friday, 9pm! ), we've nearly revealed all of our couples' Training Diary videos - in fact, there's only three left to show you... Peter and Erin, Tina and Jared, and today's couple, Kara Tointon and Artem Chigvintsev. What do you think of Kara and Artem? Leave your comments below. Strictly returned to BBC One in Autumn 2005 for a third series, this time boasting a cast of 12 eager new celebrities. Fiona Phillips became the first GMTV presenter to brave on the dancefloor, as did the likes of Gloria Hunniford, Dennis Taylor and Jaye Jacobs. More successful this time round included actress Patsy Palmer, chef James Martin and BBC Breakfast presenter Bill Turnbull. In the end, the final was a three-way tussle between Zoe Ball and sportsmen Colin Jackson and Darren Gough. In a surprise twist, underdog Darren Gough and his partner Lilia Kopylova snatched victory to be crowned winners of Series 3. When Strictly Come Dancing became such a huge overnight hit, the BBC rushed to get a second series on-air as soon as possible. So only four months after Natasha Kaplinsky was crowned winner of the first series, ten brand new celebrities hit the dancefloor in Autumn 2004 for series 2. Memorable moments from this series included Quentin Wilson's legendary Cha-Cha-Cha (which earned only 8 points from the 4 judges, the worst score in Strictly history! ), Julian Clary doing his 'An Officer And A Gentleman' impression at Blackpool's Tower Ballroom, and some spectacular routines from the likes of Denise Lewis, Aled Jones and Roger Black. And whilst Tess Daly was on maternity leave, Series 1 winner Natasha Kaplinsky stood in alongside Brucie as presenter for a few weeks! Eventually triumphing as the winning couple in Series 2 was actress Jill Halfpenny and her partner Darren Bennett. Watch the clip below to enjoy again one of their dances from the grand final. The excitement's really starting to build up as the first live show for series 8 of Strictly Come Dancing hurtles towards us this coming Friday, 1st October. In order to get us all in the mood for a brand new series of sequins, sparkle and strained ligaments, we thought now would be a great time to take a nostalgic look-back at the winners of the first 7 series. We kick off where it all began, back in Spring 2004 with the very first series of Strictly - do you remember celebs like Lesley Garrett, Claire Sweeney and David Dickinson taking part? And who could forget the dynamic pairing of series 1 winners newsreader Natasha Kaplinsky and Brendan Cole? Below we present the moment when Natasha and Brendan were crowned champions, and one of the spectacular dances they performed in the final. This video is presented in tribute to comedian Jason Wood, who was actually the first person ever to be voted off Strictly Come Dancing. He died in February 2010 at the tragically young age of 38, and everyone here at Strictly Come Dancing sends our condolences to his friends and family. The excitement is really building here in BBC TV Centre, 'coz we're officially into Strictly Come Dancing week! There's only four days to go until the first live show of the series (Friday, 9pm, BBC One/BBC HD), with the second show following hot on its heels on Saturday at 6pm. Over the next four days, we'll present the final four training videos, so you'll be able to get a glimpse of how all of our couples are looking ahead of the first show. Today, it's the turn of glamorous actress Felicity Kendal and her partner Vincent Simone. Share your thoughts on Felicity and Vincent's chances by leaving a comment below! He's starred in Hollywood blockbusters and British movie classics as diverse as "2012", "The Guru" and "East is East" - but will Jimi Mistry end up in the Strictly Come Dancing Walk of Fame? Here's another Web Exclusive training video showing Jimi and his partner Flavia Cacace in the first days of rehearsal. What do you think of Jimi and Flavia? Share your thoughts with the world in the Comments section below! With only ONE WEEK to go until the first Live Show of Strictly Come Dancing 2010 (Friday 1st October, BBC One/BBC HD, 9pm-10pm! ), the excitement is mounting day by day. Today's training video sees former MP Ann Widdecombe and long-time Strictly favourite Anton du Beke take to the floor. What do you think of their partnership? Will they get a landslide victory from the judges and the public, or will they end up losing their deposits? Share your thoughts on Ann and Anton's partnership with the world by leaving a comment below. It's time for another of our exclusive web-only training videos, going behind-the-scenes on the preparations for Strictly Come Dancing 2010! Today, it's the turn of comedian, actress and psychologist Dr Pamela Stephenson, along with her dance partner James Jordan. How are they shaping up? There's only a week or so left until the first live show on Friday 1st October. Share your thoughts with us by leaving a comment below. We know you’re all eager to see Ann’s training video, but hopefully this picture will keep you smiling until we can post the latest clip. Seven of the celebrity couples face the Strictly judges for the first time AND the professionals will dazzle audiences on the brand-new set when they perform a new spectacular group routine. While seven of the couples can breathe a sigh of relief, for seven more, their nerves will be tested as they take to the floor and face the panel of judges for the first time. 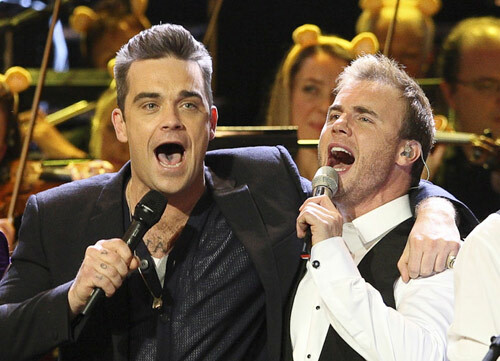 Plus, the BRILLIANT Robbie Williams and Gary Barlow will perform their fantastic new duet, Shame. Put these dates and a few gold stars in your calendar because our favourite dance contest is about to kick (ball change) off! Have you got a suitable caption for the picture above? Please keep it clean, and no nasty comments either thank you! Leave your suggestions below! We're being really good to you, aren't we - here's the latest training video of this year's Strictly Come Dancing contestants. Today, you've got the chance to study the form of actress Patsy Kensit and her partner Robin Windsor - one of the new professional dancers who've joined the show this year. Will Patsy and Robin glide across the dancefloor with the precision of a Holby City surgeon's knife? Or will their routine end up in Intensive Care? You'll have to wait until the first live shows on Friday 1 and Saturday 2 October to find out...! It's that time of day again - time for an exclusive look into the Strictly training rooms. Gavin has been hard at it with his "scrummy" partner Katya, but can she turn this fly-half into a half decent dancer? Take a look at this exclusive video and let us know what you think. And while you're at it, why not check out Michelle, Paul, Scott, Goldie and Matt's training videos. Can Scott sweep Natalie off her feet with his irresistible dance moves? Or will his ‘running man’ step fail to impress? Find out in their first exclusive training clip. Looks like Ola's got her work cut out for her as cheeky Paul begins his dancing journey! Internationally famous through his TV series The Paul Daniels Magic Show, Paul's used to the odd sequin and a glamorous partner - but will the judges be spellbound by his moves on the dance floor? Is Paul the one to watch? Do you think he still has a few tricks up his sleeve? Catch the first glimpse of their training in our exclusive clip below. He's used to tackling massive challenges from his days as a Blue Peter presenter - but will Matt Baker be able to deal with the rigours of the Strictly Come Dancing training room - and with his partner Aliona Vilani? Watch our latest exclusive video clip and let us know what you think in the comments below! The BBC has today announced that pop superstars Robbie Williams and Gary Barlow will perform their new duet “Shame” on the brand new series of Strictly Come Dancing, Saturday 2nd October, 2010. From spinning tunes to giving us a twirl - can Kristina whip DJ Goldie into shape? Take a look at this exclusive video clip and let us know what you think. Enter your questions for It Takes Two! It Takes Two will be returning to our screens! .....And they need YOUR help to make the show extra special. Out of the Glitter Ball and into the fire! It Takes Two is once again after the all important questions that you Strictly fans want to ask the stars of the show. Send us your questions and we'll get you the honest, straight up answers (well we'll try to anyway!). Leave the questions and conundrums you've been dying to have answered below, and we'll do our best to ask as many as we can. Please note that by contributing to this thread, you agree to allow the BBC to use your comments on It Takes Two. The BBC reserves the right to use as few or as many comments as necessary. Not all comments will be used. We promised you web exclusives and here's the first one - a sneak peak at Michelle and Brendan in the training room. Hello! I hope you enjoyed the launch show. We certainly did! "The celebrities practiced one ending only to the routine; however the professional dancers rehearsed seven different endings - one for each potential celebrity. Just before the routine was performed, the choreographer was able to quickly remind the dancers which ending they had to dance - but as professionals they could adapt easily." So well done to those who guessed correctly! And what do you think of the celeb dancing so far? We caught up with the Strictly Come Dancing 2010 celebrities and their new pro dancing partners straight after the announcements on the launch show. Find out what their first reactions were in our EXCLUSIVE video. We caught up with the 14 new celebrities after they nervously ventured down the red carpet on their way to the launch show. What our EXCLUSIVE video to find out their immediate reactions. It feels as though we've been waiting forever, but finally the time is upon us - the Strictly Come Dancing Launch Show will be shown on Saturday 11 Sep at 6.25pm on BBC One and BBC HD. Use this blog entry to talk about the Launch Show. Hopefully this video captures some of the excitement of today's star-studded event, and whets your appetite for Saturday's show. It was great to see all of the celebs, judges and pro dancers in their full Strictly regalia and it's looking like a fantastic line up. TV Centre is buzzing... the Launch Show is nearly here! Last night, we revealed this year's 14 brand new Strictly celebrities - and what an overwhelmingly positive response they've received in the press and online - thanks for your supportive comments! This afternoon, our attention now turns to the corridors of BBC TV Centre - because today is the day when the Launch Show for this eighth series of Strictly Come Dancing is recorded! There's a hive of activity everywhere in BBC TV Centre today - a big red carpet parade area has been set up in the famous 'concrete doughnut' of TV Centre, and there's a big group of eager members of the public already queueing up, waiting for their first glimpse of the celebs, the pro dancers and the brand new members of our Dance Troupe. And if you weren't lucky enough to get a ticket for today's Launch Show, you won't have long to wait - it's being shown at 6.25pm THIS coming Saturday evening, on both BBC One and the BBC HD Channel. The show will be an hour long and will feature all the action from the red carpet, interviews with everyone involved with the show, and several spectacular group dances from our fabulous professionals. Most importantly, you'll be able to see the moment when the celebs and the pro dancers discover exactly who they've been paired up with! If you'd like some up-to-the-minute behind-the-scenes pictures from today's Launch Show, make sure you follow us on Twitter! Our Celebrity Dancers for 2010 revealed! In a break from tradition, we're not going to announce which Pro Dancer each celebrity will be partnered with just yet. To discover who'll be dancing with whom, you'll have to watch our launch show on BBC One and BBC HD at 6.25pm this Saturday, 11th September. Our brave couples will then have just three weeks to prepare themselves for the first LIVE shows on Friday 1st and Saturday 2nd October. Good luck to them! So who's your favourite? Is there anyone you're definitely going to be supporting? Have your say below! Yes, it's that time of year again - applications for the random draw for tickets to the Strictly Come Dancing live shows are OPEN! If you'd like to be in with a chance of being in the studio audience for Strictly Come Dancing, you'll need to head over to the BBC Tickets website. As in previous years, they're operating a random draw to make the allocation of tickets as fair as possible. But you'll have to be quick - applications for shows for the whole series will close at 10pm on Thursday 16th September. Series eight of Strictly Come Dancing will return with a live Saturday night competition followed by a Sunday night results show in which viewers will see their favourite competitors saved from elimination. The Sunday night results show will be presented together by Tess Daly and Claudia Winkleman. BBC Controller of Entertainment Commissioning Mark Linsey says "Strictly pioneered the Sunday night results format and this year we're back with the perfect finish to the weekend. Tess and Claudia were the obvious choices to present and we're really proud that a fresh Strictly will return with must-see, family event television." The 30-minute results show will not feature a dance off, but will feature a pro-dance performance and the all-important elimination. The first live competition shows will be split over Friday October 1st and Saturday October 2nd and won't be followed by a results show. Instead, the judges will score the competitors to create a leader board, which will be carried over to the second week. The show will then follow a Saturday night competition followed by Sunday night results format. This will allow audiences two weeks to decide on their favourite before voting. Claudia Winkleman says "I'm properly excited about working alongside Tess on the Sunday results show. I'll be fully immersed in all things tango and sequin as I'm still hosting It Takes Two weeknights on BBC Two as well. They've just told me the line-up. One word. Excited." Series eight of Strictly Come Dancing will launch with a one-hour show on September 11th, and the first live show will transmit on October 1st. The first results show hosted by Claudia Winkleman and Tess Daly will transmit on October 10th. So there's some big news there, isn't there? Are you excited by the new format for the Sunday results show? Share your thoughts below!